Three political figures in the province finally stopped the speculations that they will now go in separate ways in the next polls. 1st district Cong. Francisco “Lalo” Matugas, 2nd district Cong. Guillermo “Jun” Romarate, Jr., and City Mayor Ernesto “Nitoy” Matugas told journalists in a press conference that they are still united amidst reports of discontentment and disunity among themselves. “Just now, we (Cong. Lalo and Mayor Nitoy) finally declare our unity in the upcoming 2013 polls. Our plan is that Nitoy Matugas is still our city mayor, Sol Matugas (Cong. Lalo’s wife) is the governor, Jun Romarate is the congressional bet for district 2, and Lalo Matugas for district 1 for 2013,” Romarate disclosed during the recent closed-door meeting with Cong. Matugas and Mayor Nitoy along with their political analysts right after Gov. 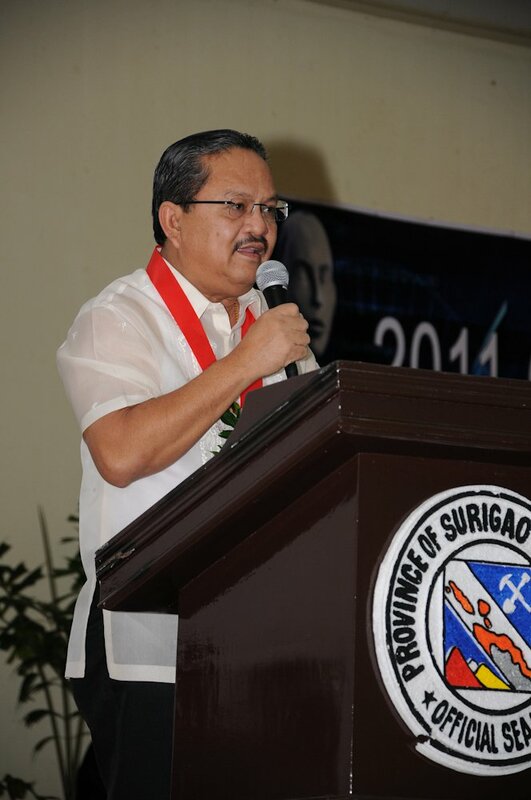 Sol’s State of the Province Address (SOPA) on Jul 6 at the office of the provincial governor. “We have already patched-up some issues and concerns among ourselves, it’s now okay,” Romarate said. Cong. Matugas, on the other hand, is hopeful that with this recent event this would eventually put an end to the speculations of disunity within their organization. “We are one and solid in the Partido Padajon Surigao,” declared Cong. Matugas, who is also the founding chairman of the local party. “We have with us our three musketeers, Balgamelo Ma (Mayor Nitoy’s political analyst), Ronald Eupena (Cong. Matugas trusted ally), and Victor Buyser (Cong. Romarate’s chief of staff) to settle the issues on the ground,” he added. Meantime, Mayor Matugas described the issue as a very minor and that they are now looking forward to a brand new direction.